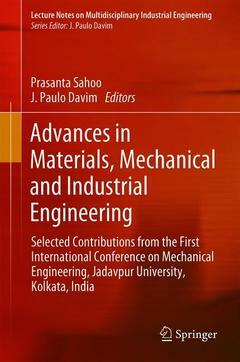 This book presents selected extended papers from The First International Conference on Mechanical Engineering (INCOM2018), realized at the Jadavpur University, Kolkata, India. The papers focus on diverse areas of mechanical engineering and some innovative trends in mechanical engineering design, industrial practices and mechanical engineering education. Original, significant and visionary papers were selected for this edition, specially on interdisciplinary and emerging areas. All papers were peer-reviewed. Investigation and Optimization of Tribological Behavior of Electroless Ni-B Coating at elevated Temperatures.- Enhanced Thermal and Mechanical Performance of Functionalized Graphene Epoxy Nanocomposites: Effect of Processing Conditions, Different Grades & Loading of Graphene.- Behavior analysis and comparison of tribological characteristics of electroless ni-b coating under dry and lubricated condition.- Friction and wear characteristics of heat treated electroless Ni-P-W coatings under elevated temperature.- Hardness, friction and wear trends of electroless Ni-W-P coating heat-treated at different temperatures.- Transition Reference Temperature for 20MnMoNi55 RPV Steel at Different Loading Rates.- Transition Reference Temperature for 20MnMoNi55 RPV Steel at Different Loading Rates.- Comparative study of cyclic softening modelling and proposition of a modification to ‘MARQUIS’ approach.